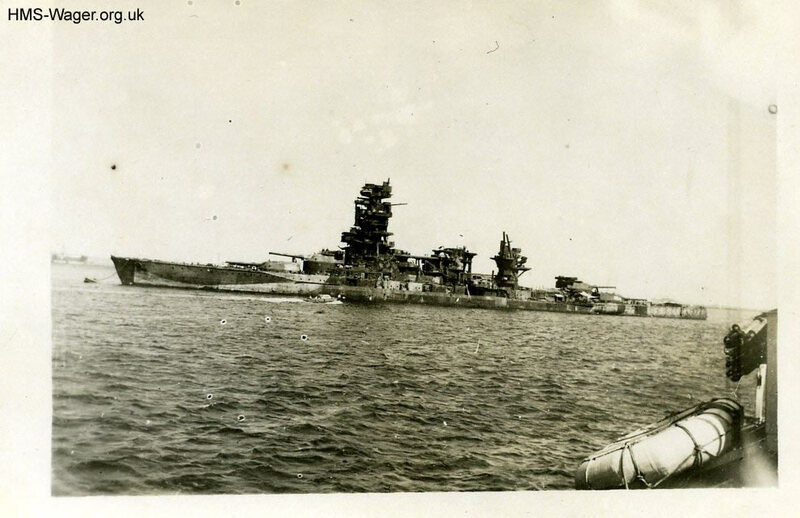 The damaged Japanese battleship Nagato (1920) at Yokusuka, a naval base near Tokyo, in 1945. She had been reduced to a coast defence ship in early 1945, when fuel and spares shortages meant she was unable to put to sea. She was attacked by American carrier-borne aircraft on 18 July 1945 and, if this photo was taken from HMS Wager, the date would be between 28 August and 10 September 1945. Some 42,000 tons displacement, she was the first warship in the world to mount 16-inch guns. She saw no action at the Battle of Midway in June 1942, but took part in the Battle of Leyte Gulf in October 1944. In March 1946 she was taken to Bikini Atoll and expended as part of the atom bomb tests in July 1946.